Tanger Outlet Center has more than 90 name brand stores, including Bare Minerals, Christopher & Banks, DSW, Under Armour, J.Crew, Kate Spade, Michael Kors, New York & Company, Nike Factory Store, Pottery Barn Outlet, and Skechers. Enjoy savings up to 65% off every day. Tanger Outlets at Jeffersonville is centrally located between Columbus, Dayton and Cincinnati, and only 45 minutes south of Columbus on I-71 at Exit 65. Visit www.tangeroutlet.com/jeffersonville to view a list of stores and sales. 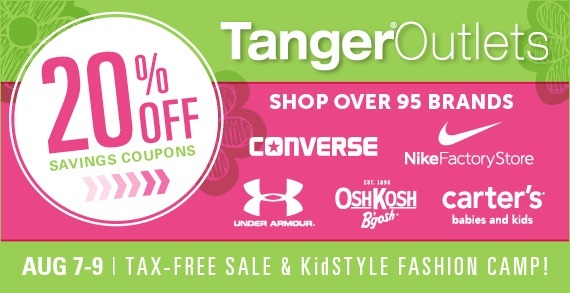 Download your TangerStyle Fall Savings now! 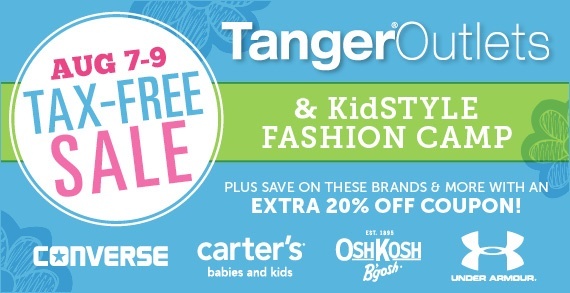 Get TangerStyle 20% Off Coupons now through August 23rd! Tax-Free Weekend and KidStyle Fashion Camp August 7 -9.